Wendy believes that nothing great is ever achieved without enthusiasm. Her enthusiastic, optimistic, and animated style enables her to create a dynamic and energetic training environment enabling her to elicit fresh perspectives and solutions from her clients. She loves to share her practical insights on how to recognize and develop leadership in our businesses, our communities, our homes, and ourselves. Wendy is originally from Louisiana, and she remains true to her roots by loving all foods that are fried, the New Orleans Saints, and still believes saying ma’am and sir are the utmost signs of respect. Currently she resides in Mechanicsville, VA where she and her husband are having a blast raising their two teenage boys to be brave young men of character. Wendy helps people tap into their amazing potential through her extensive experience in corporate training and organizational development. 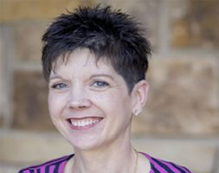 By connecting with her audience through an engaging and humorous speaking style, Wendy works to create authentic, meaningful, and memorable experiences for all participants. Her personal mission is to help others become the best version of themselves by providing effective tools and strategies that will make an immediate impact in their daily lives. - Holly Davis, E. S. Chappell & Son, Inc.